We celebrate when our friends and loved ones accelerate their consciousness into the higher dimensions. If we miss them, we merely use our multidimensional communication ability to connect with their essence. Therefore, when they move into the higher worlds, we rejoice with them, as we know that their reason for incarnation has been fulfilled, and they are ready to return to the higher worlds. I was not aware, yet, if my family (as everyone on Antares is our family) were able to fulfill their mission. Perhaps they are doing that now through me. I will carry them all in my heart as I return to my story. Since the Draconians believed that everyone was dead or captured and all our ships were destroyed, they made no attempt to hide their trail. Also, the new ship that I was flying was equipped with sensors that could receive information from much greater distances than our other ships. Most of important all, this ship had a cloaking device. So, I could not be seen on their sensors. As I thoroughly investigated the ship, I could see that my Father had a great deal to do with this advanced technology. I had never known that part of him, which made me sad. I always thought that I would study with him when it was my NOW to enter the Temple of Remembering. In a way, though, I was with him. It was as if he had left a small component of his essence inside me when he slipped into my form to show me how to operate the ship. With that thought, I felt an inner recognition of that truth. Yes, somehow he had left a fragment of his personal essence in me. I wondered what that would cost him in his own personal return to the higher dimensions. “I will retrieve that spark of my essence when our people are back,” I heard him say inside me. My consciousness soared with that simple message. I realized that I was NOT alone. In fact, as I allowed myself to surrender into his essence I felt the joint essence of all those from our community who had assisted in my healing. “We will stay with you dear Jaqual until your mind is as mature as your body,” they said as ONE being. With those short messages from my people in the higher dimensions, all my insecurities were erased. I was NOT alone. My family of light in the higher planes was with me in my heart and mind. “Thank you for releasing our bodies,” was their final message. I knew that it would be increasingly difficult for us to communicate as I flew further and further away from our planet. We had been taught that our planet was alive and served as a “light beacon” for our consciousness to return to, communicate with and/or through. Hence, even if our ships were disabled, we could still communicate with our people on the planet through the massive, living essence of our homeworld. However, if we were too far from the planet, the communication would not work or there would be a long time delay. I was quickly moving away from the planet that had always been my home. However, it was my NOW to “come of age,” and I had to do it alone while traveling through increasingly unknown territories of space. With the support of the many that I had known and loved, as well as the cries for help from those who had been captured, I easily released what I had once conceived of as my youth. Knowing that none of my Antarian family had actually “died,” but had only returned to the higher dimensions soothed my grief and allowed me to focus on my mission. I had sent out my message to our people who were off planet before the ship took off, but I dared not send a message via technology while in space, as the Drac’s could easily intercept it. Fortunately, the messages from my higher dimensional family gave me an idea. If I could so easily communicate across dimensions with my mind, then certainly I could communicate with my own family while in the same dimension. I put the ship on autopilot with the auditory warnings on so that I would be instantly informed if there was any danger while I was in telepathic communication. During my yearly visits with my Father, he had taught me inter-dimensional communication, as well as long distance planetary communication. As I looked back at everything my Father taught me, I realized that he had known about the possible reality that had just occurred. It was not a far stretch of the imagination that the Dracs would invade us, as we had been their mortal enemy during the entire ongoing Galactic War. With that reminder to my self, I began to remember everything my father had taught me about long-distance telepathy. I instinctively knew that I had to focus ONLY on the love I had for my people, as that was a carrier wave that the Dracs could not perceive. Love was an unknown experience in their society. The Draconians were hatched out from a hole in the ground in which they were buried for their safety. The first ones to hatch were those closest to the surface and the least mature. Most of these first hatchlings were eaten by predators, including other Dracs, and by the more mature hatchlings that hatched after them. In our world our consciousness was joined within the ONE, and we all sought our power- within. However, in the Draconian worlds, ONE meant each individual. Therefore, there was no attachment to other Dracs. Their mother left the nest once the first eggs began to hatch and never turned to love or protect them. If the new Dracs survived the first moments of their hatching and somehow found a safe place to hide, their chances of living to adulthood was very small. However, because their survival was always at risk, and because their survival was focused only on their self, they were the most vicious warriors in our quadrant of space. The fact that they were now taking slaves revealed to me that their society was breaking down. Before, they took only technology and killed everyone else. Now, their numbers were so diminished from the ongoing war, that they needed humanoids to care for the components of their life that could not be managed by machines. “Enough thinking!” I heard myself say. Yes, it was the NOW to telepathically communicate with our off-planet warriors. I forgave myself for my mental wandering as I fully understood that even a spec of fear in my consciousness would be a strong message sent directly to the Dracs. As predators, they were experts at sensing fear. I checked the controls on the ship one more time then went into a deep trance. I remembered to connect with the deep love being sent to me from my higher dimensional family and sent out a beacon of unconditional love. I knew that unconditional love resonated to the fifth dimension, which was beyond the awareness of the Draconians. Therefore, they could not intercept my message. Before I made first contact with my people in the starship or off world, I saw a blueprint in my mind of a way to adapt the ship’s communication system to the fifth dimensional frequency. I then heard my father tell me that he was working on that before the attack. He even told me where he had hidden his plans in the ship. I briefly told him all that had occurred and gave him my location. He was fully aware that it was not wise to communicate through our technology, as the Dracs might be able to intercept it. Therefore, he told me to hold my state of consciousness while he connected with the others on his mission. Since I was within the NOW of the fifth dimension, I had no idea how long it was before he returned. I had put the ship on audio alert so that I would hear if there was any problems with the ship. Of course, the ship was flawless in its performance, thanks again to my Father. I dared not search my mind for my Father now, as I had to maintain full contact with Commander Malteese. Also, I knew that the sadness of him not being with me could lower my consciousness. Instead, I focused on remembering all the “mind over matter” lessons I had learned while visiting my Father in the Temple. I then projected my entire experience into the minds of the thirteen, while constantly reminding them that our connection would be lost if they experienced fear or sorrow. As trained warriors, they remained in a mental state of clarity, balance and non-reaction. They took in all the information with the sole intention of rescuing our people. Soon a plan was formed, and I was to be their leader. I tried to tell them that I had only been an adult for a short while, but they all agreed that I had earned that title. Besides, I knew more than could be transmitted via telepathy. Within my unconscious were the faces of the Dracs who had entered our home. Also, thinking we were all dead, I suddenly, with the assistance of our mind-link, remembered that they had discussed the location where they would take our people. My Draconian language ability was not exact, but as I shared what I knew, the others were able to assist with the proper translation. We decided to meet on an M class planet close to the Drac’s destination, but far enough away to be safe for us to meet. We were greatly outnumbered. Hence, we would only have one chance to surprise the Dracs enough to rescue our people. We had to get it perfect the first time. Therefore, we needed to have a tight plan and work as ONE person. To make matters more difficult, we knew we would need to act before our people were sent to different locations to serve as Draconian slaves. With that thought, our group suddenly felt two of the captured Antarians join in our communication. Now we knew exactly where they were without every needing to consult our technology. This was excellent news as the Dracs were the most technologically advanced race in our quadrant. 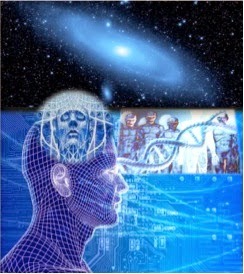 we could achieve with our multidimensional, unity consciousness.